I’ve had a bit of low-level anxiety this April about Easter. gifted J with a venus flytrap plant inspired by a family trip to see friends in “Little Shop of Horrors.” You would think he’d be magical enough to know that she’d been having nightmares about flesh-eating plants for weeks, but it took her until the new year before she finally talked to her parents about it. Crap. In years past, I would go into the storage area and pull out a few items that the Easter Bunny might need, like some plastic eggs, a bit of fake grass, and a couple of baskets. And then I’d drag the boxes with the rest of our Easter stuff out for the girls to enjoy. This year, some of the stuff is missing: a large collection of plastic eggs, a plastic egg-holding platter, a small Thomas the Tank Engine Easter train, and, most sorely missed, a fluffy chick who sings the Chicken Dance song. I have no idea where this stuff went. I might have thrown away the plastic eggs, but I never would have just gotten rid of the Chicken Dance Chick. And I have visions of setting some of these items aside, but did that happen a month ago, or two years ago? I have no idea. When J said that the box of plastic gewgaws was her fondest Easter wish, I went straight home and tore the house apart. M helped. Then Cute W came home and helped, too. No luck. So, not only do I not have a “headline item” of Easter fun, but I feel really quite confident that there’s not enough magic to make these items appear. I was feeling pretty bad about it, really. I gave J as much advanced notice as I could manage to do without giving her too much Bunny information. And I’m still hoping that St. Anthony will gift me with a dream-vision tonight. But chances feel pretty slim. 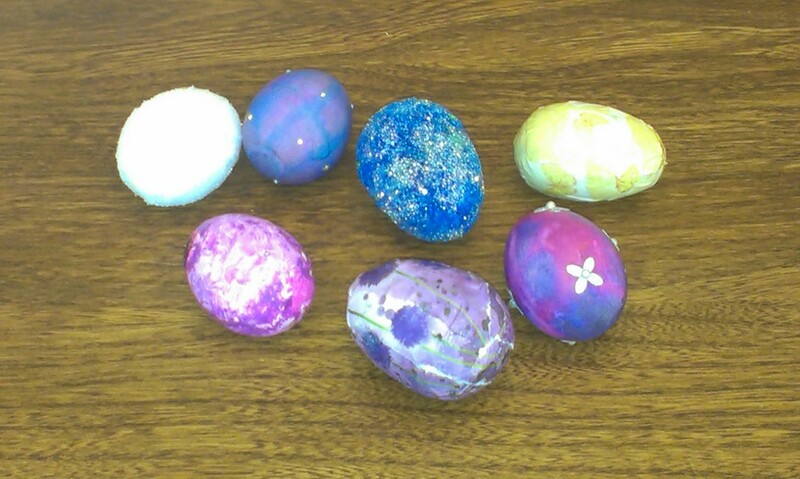 I made up for it, though, in a festive egg-decorating party. Last night we had a snacky-style dinner and collected tons of crafty supplies. Then we blew out some eggs so that we could keep them (this Youtube video helped, and it was surprisingly easy). We decoupaged and painted and glittered until everyone was paint-stained and punchy from egg-decorating exhaustion. Hopefully J will have fond memories of the evening to fill up that space left by the lack of a chicken singing the Chicken Dance song.